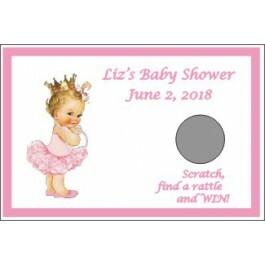 Let your guests know there is new Royalty in your family with this Vintage Princess Scratch & Win Baby Shower Game. These Scratch off cards are adorable because they’re personalized too! Don't forget to shop for your prizes and favors too! Our bridal shower section has a wonderful selection. Pass out a card to each of your guests, set at each place setting, or have guests draw a card out of a bowl. Award a prize to the winner. You'll have so much fun! 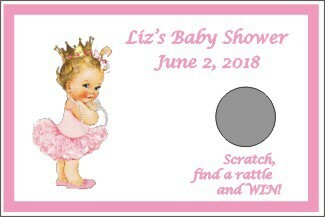 * Each card is personalized with the Mommy-to-be’s name and her Baby Shower date i.e. 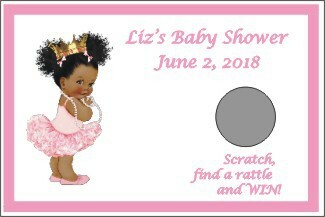 "Deja’s Baby Shower, November 23, 2020" * Each card measures 4.25" x 2.7" * Scratch off the silver circle to reveal a Pacifier (winner) * Prizes are not included * Minimum order 1 set of 12 * Select amount of winning cards per set of 12 * Scratch & Win Game can be personalized with up to 2 lines; Depending on the amount of characters per line, the text on your favor may be smaller than what is shown. Our designers reserve the right to adjust the size of the font or graphic, if necessary.